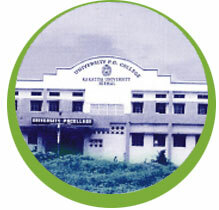 University Post-Graduate College, Nirmal was established in October 1991 as a PG Centre of Kakatiya University. The college offers PG courses in the subjects of English, Public Administration and Sociology, MBA, MCA, M.Com and PG DCA in addition to M.Phil. in Sociology. The faculty members have undertaken the projects and surveys of the Government of Andhra Pradesh with regard to a large tribal population. The college is using the expertise of the personnel at ITDA, DRDA and other district agencies to strengthen the ADIVASI MUSEUM, besides acquiring the artifacts and articles from different sources. The College has spacious building accommodating class rooms, two Seminar Halls, Library and one computer laboratory. Hostel facility is provided for the students in a separate building constructed for the purpose.